My favorite part about interviewing women on my Choices 4 Women podcast was the opportunity to meet women from all over the world. I love learning how they are making their mark on the world just as much as I love helping them share their message. Now, I feel I can take my passion for empowering women to a whole new level, by getting women in front of the camera so their potential clients, buyers and everyone who needs to meet these fantastic women have the opportunity to see who they are! Video is one of the best ways to get noticed, get your word out to the people who are looking for you, your business or your product and help with SEO. If you're ready to get noticed, here is your opportunity to be interviewed and get your message out! Nothing shows your passion and your energy like an opportunity to share your message on camera. This is your opportunity to share your book, your business, your product, your message or an upcoming event and let people witness, first hand, your passion for what you do! 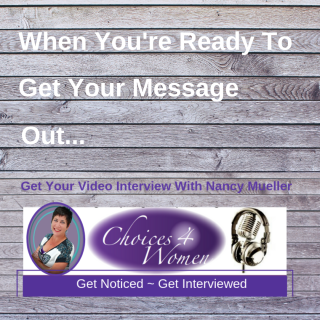 Book your interview with Nancy Mueller to be LOUD & PROUD about what you do! Nancy will help you share your message to tell people who you are, what you do and why you're so fabulous! ~ For more information, CLICK HERE to schedule a call with Nancy on her calendar. This is your time to ask questions and find out if this opportunity is right for your and your business! This platform gives you the complete spotlight, it's a great way for a you to share information about your business or product without sounding "salesy"! If you're ready to get interviewed with Nancy Mueller and Choices 4 Women to get your message out, we've made it easy for you to get started! You can BUY NOW or CLICK HERE to schedule time on Nancy's calendar to discuss your interview! I enjoy meeting women from all over the world. I love learning how you’re making your mark on the world just as much as I love helping you share your message. With these interviews I can take my passion for empowering women to a whole new level, by getting you in front of the camera so your potential clients, buyers and everyone who needs to meet you has the opportunity to see who you are! I've created this opportunity because it's an opportunity to empower each woman I interview by giving her a platform to be able to use the video or audio interview within her own marketing platform. I will share every interview on my social media platforms but you will also have the original copies to upload on your own media platforms so they can be repurposed over and over. This platform gives you the complete spotlight, it's a great way for a you to share information about your business or product without sounding "salesy" because the whole conversation revolves around the two of us having a conversation while the people who will view your interview are both entertained and informed! ​I want you to shine. I want you to shine because I believe that every single women has gifts and talents that need to be cultivated and shared with the world. Sometimes it can be difficult for people to talk about what they do without feeling self-conscious. By the time we begin your interview, you will feel confident that about being Loud & Proud to share your message! We will work together before the interview and discuss your message and the best way to present it so your finished video will have your viewers "feeling" your passion for what you do!